Travel with your private guide through the deep and exotic history of eastern Anatolia. This private Turkey tour is guaranteed to operate with a minimum of 2 passengers. Upon arrival in Ankara, you will be met by a Ya'lla Tours USA representative and transferred to your hotel for dinner and overnight. After breakfast, depart by coach for Samsun. En route, visit the most important Hittite site in Turkey, Bogazkale. The ancient capital, Hattusa is surrounded by double walls broken by the Royal Gate, the Lion’s Gate and the Yer Kapi gate which is guarded by two sphinxes. The walls between the Lion’s Gate and Yer Kapi are particularly well preserved. From atop the walls near Yer Kapi, one has a nice view over the city and the ruins of a number of temples. Also in this area is the entrance to a corbelled tunnel which may have been used for military or religious purposes. Continue to Samsun, for dinner and overnight. Today, make the scenic drive to Trabzon through forests and along the Black sea coast. Arrive at your hotel for dinner and overnight. En route to Erzurum, visit the spectacular 11th century monastery of Sumela perched 300 meters above a raging river. Drive to Erzurum, the largest city in Eastern Anatolia, for dinner and overnight. In the morning, visit the Selcuk monuments of Erzurum, including the Cifte Minareli Medrese, a theological school named for its towering twin minarets; the Uc Kumbet (three mausoleums), and the archaeological museum. Return to your hotel for dinner and overnight. Drive along the ancient Silk Road en route to Kars. See the six arched Ottoman bridge spanning the Aras river and an Armenian fortress, Hasan Kale. Continue to the abandoned city of Ani where great walls encircle beautiful churches and mosques dating from the 10th century. Arrive in Kars for dinner and overnight. In the evening, enjoy a folkloric show. In the morning, depart for Dogubayzit. The last main town before the Iranian border, Dogubayzit sits in the shadow of Mt. Ararat (5137 m), the legendary resting place of Noah’s Ark. Visit the spectacular Ishak Pasha Mosque and Palace famous for its 18th century fairy tale pleasure dome. Ishak Pasha sits high on a cliff overlooking the endless plain and the ancient Silk Route. Continue to Van for dinner and overnight. In the morning, visit the ancient Urartian settlement of Cavustepe built by King Sardur in 750 B.C.E. Proceed south to Hosap Fortress built in 1643 C.E. In the afternoon, take an excursion by boat to Akdamar Island and the 10th century church of the Holy Cross with its outer walls richly decorated in Old Testament reliefs. Return to Van and visit the Van Fortress with its cuneiform inscriptions dating from 8th century B.C.E. Dinner and overnight at hotel. Depart for Diyarbakir, a lovely city situated on a plateau overlooking the Tigris river. Upon arrival in Diyarbakir, take a short orientation tour including the ancient 5.5 meter long wall which encircles the city. Dinner and overnight. Depart for Adiyaman. En route, visit the ancient city of Harran. Known as Charran in the Old Testament, Abraham lived here on the way to Canaan. Visit the city walls, the old university and the houses shaped like beehives. Depart for Kahta in the afternoon and visit the ancient city of Arsameia on the Euphrates, the former capital of the Commagene Kingdom. Cross the old Roman Bridge of Septimus Severus built in the 1st century. Arrive in Adiyaman for dinner and overnight. Very early in the morning, around 03:00 am, ascend Nemrut Dagi by jeep to the cone shaped tomb of the Commagene ruler Antiochus I. Watch the sunrise amid the disembodied heads of the colossal statues which once adorned this funerary sanctuary. After breakfast, drive to Antakya, ancient Antioch. Visit the mosaic museum and St. Peter’s Church. Paul and Barnabas spent over a year here building a strong Church. Later, it would become the center from which Paul spread the Christian faith. Dinner and overnight in Antakya. Drive to Cappadocia. Dinner and overnight at the hotel. Visit Göreme Valley an otherworldly complex of rock chapels and churches covered with lovely frescoes. Continue to the open air museum at Zelve Valley and Avanos. Visit the underground city of Kaymakli. Built by Christians fleeing persecution, this formidable refuge had seven subterranean levels, and could accommodate several thousands of people. Dinner and overnight at the hotel. 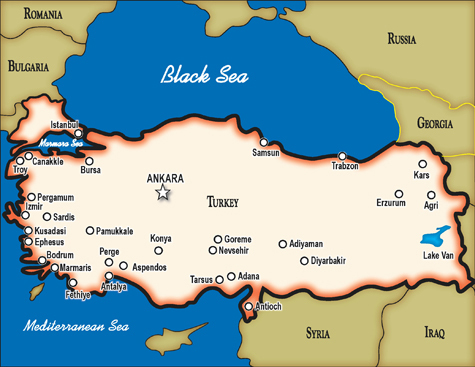 Fly to Istanbul from Kayseri or Ankara. Transfer to the hotel for overnight. Continue to St. Sophia, originally a Christian Basilica built by the emperor Justinian in the 6th century, then converted to a mosque during the Ottoman Empire. See the beautiful mosaics on display at the museum. Visit Topkapi Palace, legendary residence of the Ottoman Sultans. • Airfare one way from Kayseri or Ankara to Istanbul. • 15 nights hotel, with buffet breakfast daily. •13 days of private touring in a deluxe, air-conditioned van, with a licensed, English-speaking guide, as per the itinerary. • Airfare, other than specified.